I woke up the morning of tuesday August 15th, 2006 at 6:45am, and after looking around for a minute, realized that Scrappy wasn't on his dog bed. As I had an 9am meeting that day, I went upstairs to find him, and discovered him on his side, having passed away probably in the early morning hours. He lived to be twelve years old, and his death was a great surprise and shock to us. Although he hadn't been eating well, and was on some medication, we never suspected that anything was seriously wrong with him. He had been acting fairly normally and was as animated as ever especially when any "people" food was involved. He'd been up to all his usual tricks, jumping on the couch, and trying to steal things off Niamh's plate whenever she might put it down for a minute. We decided to have a laboratory do a post mortem exam, and later that day, they called to inform us that Scrappy had a number of cancerous growths on his liver and pancreas. One of them had ruptured, and according to the lab, although it was a sudden upredictable event, it nevertheless was inevitable. They assured us that there was nothing we or they could have done, and that he wouldn't have suffered much. 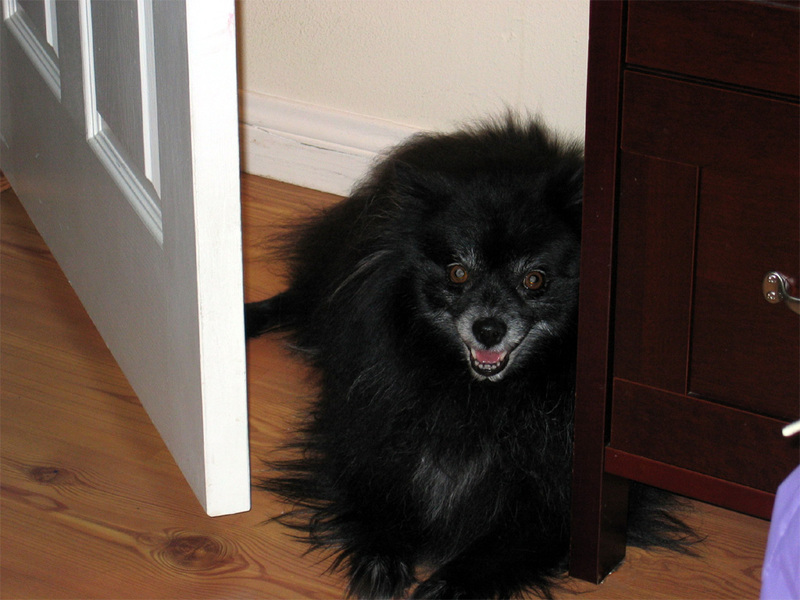 We bought Scrappy from a Pomeranian breeder located in Riverside county, which is east of Los Angeles. We'd recently moved to an apartment in West Hollywood, and wanted a companion to keep Gizmo company during the days while we were at work. Tracy had spoken to a breeder over the phone and negotiated a deal for a Pomeranian puppy who they hadn't been able to sell and was now too big. My recollection is that he was already five or six months old, but perhaps a bit younger. It was a friday after work, and we jumped into Tracy's old VW rabbit, and headed out on what would turn out to be a two hour soujourn which included our getting lost, driving up and down lightless suburban streets, and giving serious consideration to turning around and heading home. At the end of a dead end street, I finally pullled the car over and got out. The address seemed to be in the vacinity of the one we were searching for, but we were expecting a ranch or warehouse rather than the rows of tract houses. We couldn't find a street number. Then I picked up the faint sound of dogs yapping. I followed it to the garage of a house and rang the doorbell. An elderly woman answered the door holding a tiny white pom in her hands. Conor Michael Rolston was born on October 21st, 2005 at 3:00pm in the Cedar Sinai Medical center, Los Angeles California. The little guy weighed in at a healthy 9 lbs 6oz, and stands 22 inches from head to toe. My mother Doris was here with us to witness the birth of her grand son, which made the event extra special for us. He now has his own place in the photo gallery. After much cajolling, I finally got Tracy to experiment with turning the auto flash off her camera, and she took this beautiful photo of Conor sleeping. December of 2004 is a month that I expect I will remember for a long time. Although there were a few bright spots, it was for me a miserable end to a year I am happy to see recede in the distance. Recent events have reminded me that the world becomes smaller and smaller as I get older, the more I travel, and the more I ponder the way of things. With the catastrophic tragedy in Asia still unfolding day by day, it might seem trivial to some people, that I would be writing about this subject. All I can offer in response is that this is something I have wanted to accomplish in the year 2004, and I sit here in the last few hours of this year, making my own form of peace with recent events. I suppose there are two kinds of people in the world: those who see Pets as family members, and those that don't. I'm not embarassed to admit that I'm a member of the former category, and not unlike many of my neighbors here in Laurel Canyon where I live, part of my daily routine has included caring for, and spending time with my dogs. There are numerous studies documenting the therapeutic value a pet often provides to its owners, like the one in Australia where people facing chronic life threatening conditions were followed for a year. In one group, 25% of the participants died, while in the other group only 6% died. The difference between the groups is that the 6% group owned dogs, while the 25% group did not. I suspect I am no different in having been the beneficiary of that phenomenon throughout the years. These are large files (9 or 12 megabytes in size depending on which format you choose) so if you have a modem, be prepared for a substantial wait: Highlight the link and then right click and choose save as to start a download. NiamhJumps in .rm (realplayer) format or NiamhJumps in .wmv (Windows mediaplayer) format. This is a bit of a catch up entry. In January Niamh was visited by Grandma Doris and Auntie Marion. Niamh enjoyed her new friends, and some photos were taken to remember the occasion with. There's a photo with Grandma Doris, and a couple from Marion's visit, including Niamh fresh out of the bath in her pooh-bear robe.